Your chance to see a treasure-trove of Alvechurch history as the village museum opens its doors. If you didn’t know that Alvechurch had a museum, you’re probably not alone – its secluded location on School Lane means it’s not the most obvious tourist attraction. But once a year, Alvechurch Historical Society opens it up to the public, giving villagers a golden opportunity to get in touch with their heritage. The museum building is as much of an artifact as the collection inside – it’s a hut that was used as a classroom when the village school was on the site. That was 50 years ago, but there are plenty of residents who remember their schooldays there. School memorabilia, such as the memorial to scholars who lost their lives in the Great War, is only a small part of the museum’s eclectic collection, however. Visitors will hardly know where to look first – old signs from village businesses sit alongside reminders of daily life in times past, such as gas masks, a mangle, and a narrow handcart made specifically to fit down the entry alongside the old Swan pub. There’s also clothing – including a child’s coat said to have belonged to Nelson – and a vast array of photographs depicting people, places and events. 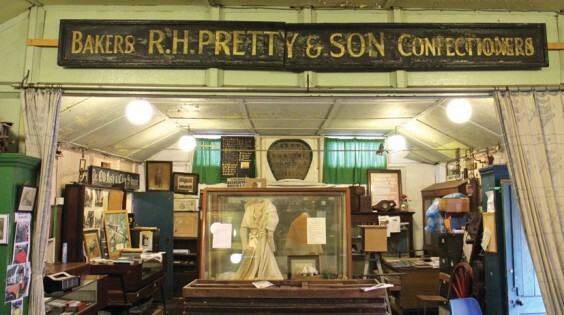 The open days take place on Saturdays September 6 and 13 from 2.30 – 4.30pm, with a special display on Shops. If you can’t make those dates, you can arrange a private visit by appointment – ring Anne Humphries on 0121 445 5955.